Both emotional and physiological stressors seem to trigger flares of interstitial cystitis in some patients. For me that was certainly the case. Therefore, I’d like to have a look at why stress can trigger interstitial cystitis flares. Stress may be one of the biggest culprits of modern life when it comes to triggering chronic illness. The problem seems to be that there is an evolutionary mismatch between the body’s stress response and what we perceive as being stressful. Stress typically activates the Fight, Flight or Freeze response in the body (a.k.a. the Fight or Flight Mode). This is because as we evolved, a stressor usually used to be a physical threat to our survival (such as a sable-tooth tiger). We are evolutionary hardwired to either fight a threat, flee from it or freeze. The adrenal glands release the ‘stress-hormones’: Adrenaline, noradrenaline and cortisol. These hormones circulate throughout the body, activating every cell to prepare for emergency action. Blood is directed to where it is needed most: the brain (to make clear decisions) and the muscles (to fight or run). Respiration and heartbeat quickens to take in and distribute extra oxygen. Blood pressure rises to increase supply to all areas of the body. The liver releases stored energy – glucose and fats flow into the bloodstream to provide a quick source of fuel for energy. Blood clotting increases to help prevent us from bleeding to death from potential injury. Muscles tense, ready to react. The skin sweats to cool hot muscles. Blood from the skin is diverted to muscles. In our modern world we seldom see the same threats/stressors our ancestors did but the stress response in the body has not changed. The stress response is now seldom needed to ensure our survival, however it is still triggered frequently. The body can’t distinguish between physical, emotional or mental stress. Due to the stress response in the body, stress may trigger an array of symptoms, including interstitial cystitis. Several studies have shown a connection between early childhood trauma and acute and chronic stress and the development of lower urinary tract symptoms (LUTS), including IC . One hypothesis as to why this occurs is the bladder-gut-brain-axis (BGBA). 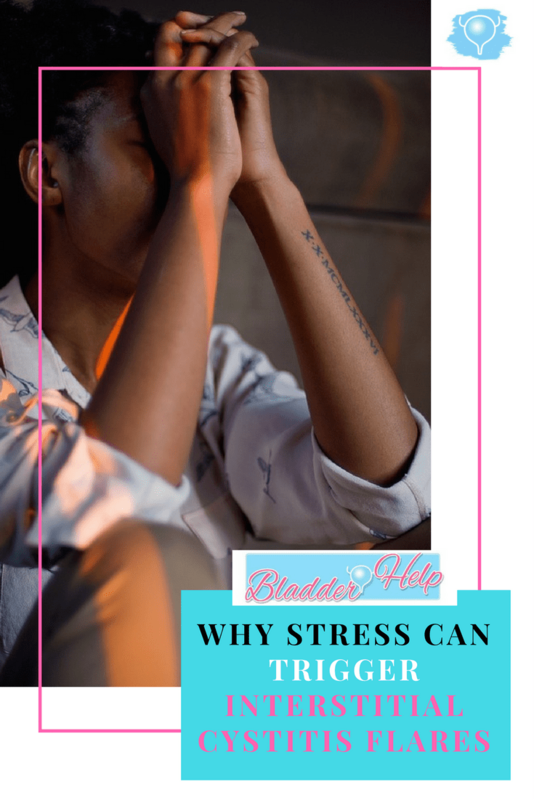 Functional disorders of both the gut and the bladder are often associated with stress experiences and trauma. In this hypothesis, it is believed that previous outside and mental stressors cause the onset of symptoms and depression/anxiety. The BGBA may become over-sensitized to this ‘threat’, so any future stressors might mediate a false alarm signal as a defence system and both physical and emotional symptoms are triggered again . The fact that many women with chronic urogenital pain disorders report abuse at some point in their lifetime and/or conflicts or stress in key relationships supports this hypothesis and suggests that unresolved abuse or emotional conflicts could trigger or worsen urogenital symptoms . Another theory relates to mast cells. One of the stress hormones that is released during the stress response is called Corticotropin-releasing hormone (CRH). CRH has been shown to be able to activate mast cells, resulting in the release of histamine that can trigger unpleasant symptoms . In rats, stress has been shown to activate at least 70% of mast cells in the bladder. However, not all of this was due to CRH but also other molecules that are released during the stress response . The effect of stress on IC may therefore be two-fold. It should be no surprise that stress-reduction techniques such as MBSR have shown promise for reducing the symptoms of IC. Stress management should play a role in any treatment plan for IC and I will explore different options in future blog posts. Now I’d like to hear from you: Does stress trigger your IC to flare up? What have you done about it? Let me know in the comments! Totally! And unfortunately stress is also the hardest thing to change…I have changed my diet etc but stress is still and issue I have not completely managed to deal with! Having both Pelvic Floor Dysfunction and IC for over eight years, I know that yoga and Biofeedback, both stress reducers are crucial to my recovery. The biggest stressor is when I’m in a food flare or have a UTI and you have to fight that fear! You have to know that it is temporary and calm your mind and body. Just knowing that you can do this and be pain free helps. Death of my 21 yr old kitty, Zofya, whom I raised by bottle feeding, as she,was deposited on my Porch as,a runt…went two months wo macrobid and now has returned… stress?